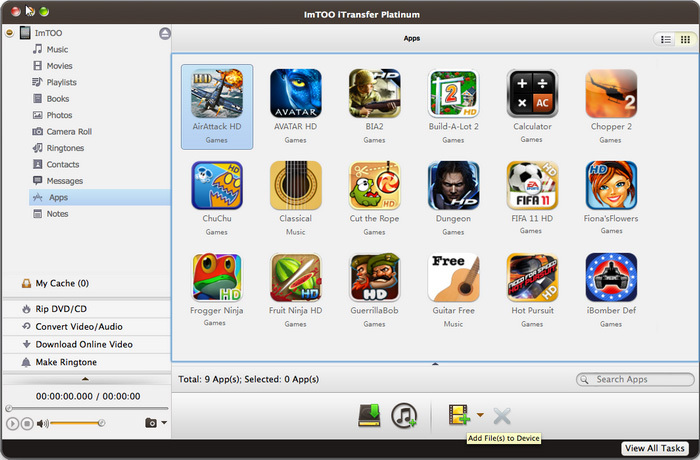 ImTOO iTransfer Platinum for Mac is must-have software for iPad/iPhone/iPod users. 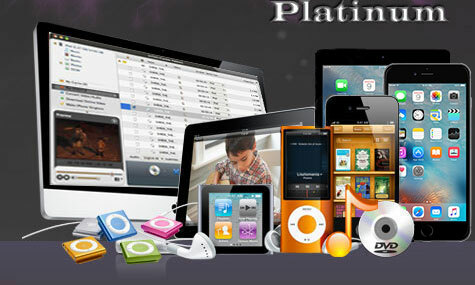 It can transfer various of files between your iPad, iPhone, iPod, iTunes and Mac, convert DVDs/CDs to iPad/iPhone/iPod supported movies/music, convert all popular videos/audios to iPad/iPhone/iPod, download online videos and convert to compatible formats for playback on your iPad/iPhone/iPod in one-step, make special personalized iPhone ringtones from your favorite video or music. Establish and edit photo albums and playlists, find what you want in a short time with the quick filter function, preview DVD movies and videos with the built-in media player to decide which ones to transfer, logon top online video websites with the embedded web browser, connect several devices with Mac at the same time and switch between devices to transfer freely and etc. 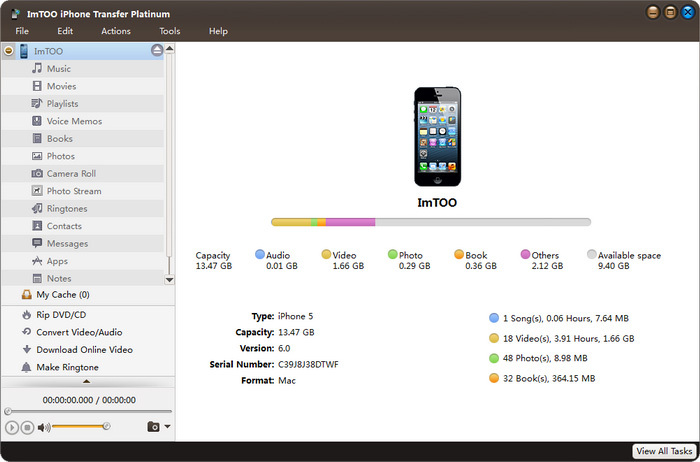 Transfer and save your music, videos, photos, playlists and eBooks from iPad/iPhone/iPod to Mac or iTunes for backup and management. 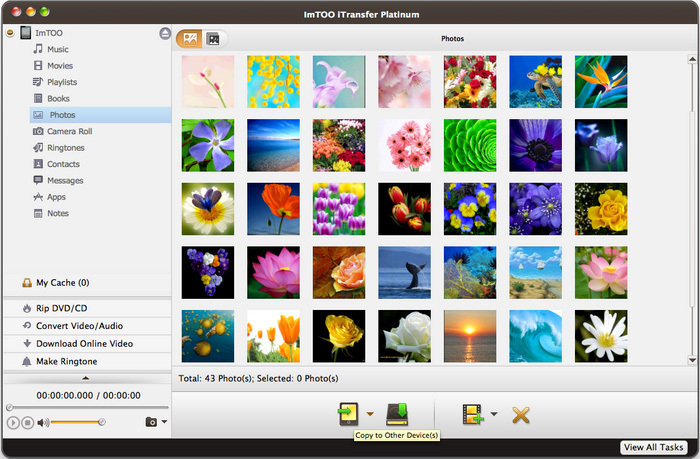 Easily transfer multimedia files from Mac to iPad/iPhone/iPod to enjoy them on your devices. Not only transfer apps between your Mac and devices, but also manage documents for some apps. 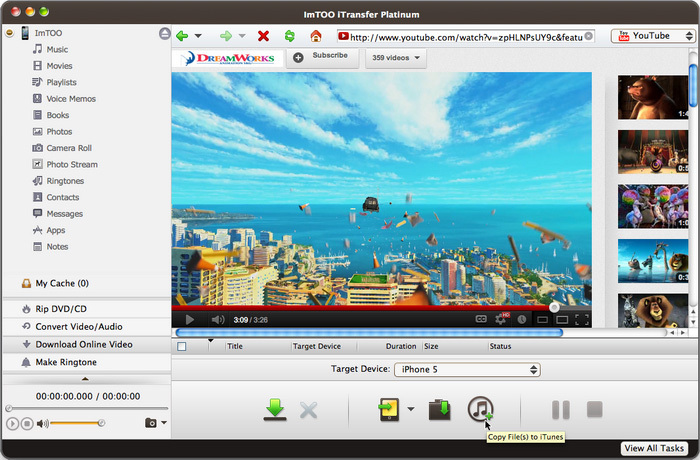 Convert DVD/CD to iPad/iPhone/iPod supported video and audio files and transfer to them directly. Convert any popular format video/audio, even HD videos to play on your iPad/iPhone/iPod, such as AVI, MPEG, WMV, FLV, MOV, MKV, MPG, MTS, RMVB, M4V, WMA, OGG and etc. One step download & convert online videos from popular online video sites like YouTube, Metacafe, Dailymotion, Break, Vimeo, Revver, Blip, Vidilife and Stickam, and transfer to the devices instantly. Make favorite segments of an audio/video to your special and personalized iPhone ringtones. Fully support all devices models: iPad, iPad 2, iPad 3, iPad 4, iPad mini, iPad mini 2, iPad mini 3, iPad mini 4, iPad Air, iPad Air 2, iPad Pro (12.9/9.7/10.5 inch), iPod, nano (5th Gen), iPod mini, iPod shuffle, iPod classic, iPod touch, iPod touch 4, iPod touch 5, iPod touch 6, iPhone, iPhone 3G/3GS, iPhone 4, iPhone 5/5S/5C/SE, iPhone 6/6 Plus, iPhone 6S/6S Plus, iPhone 7/7 Plus, iPhone 8/8 Plus, iPhone X, iPhone XS, iPhone XS Max, iPhone XR. Manage files in your iPad/iPhone/iPod very easily. Create photo albums by the pictures shot by device; edit or delete existing playlists in iPad/iPhone/iPod easily. 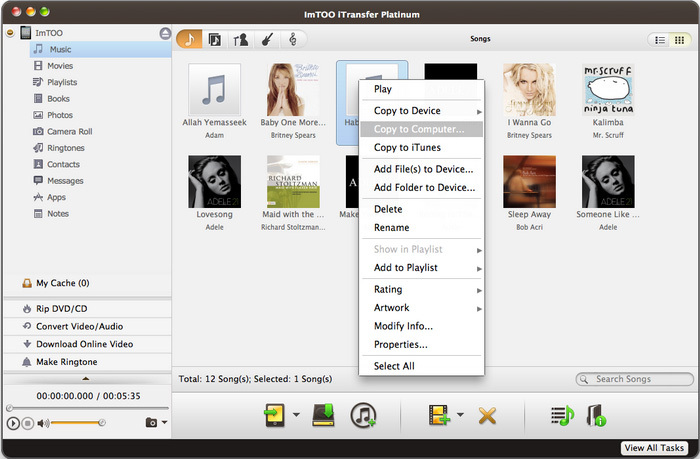 Edit the ID3 information for multiple music files such as name, artist, album, and year. Copy music, movies and playlists to device, computer or iTunes. Transfer apps and manage app documents easily. Customize column to show the details of file. Connect several devices with Mac at the same time and switch between devices to transfer and share the files freely. 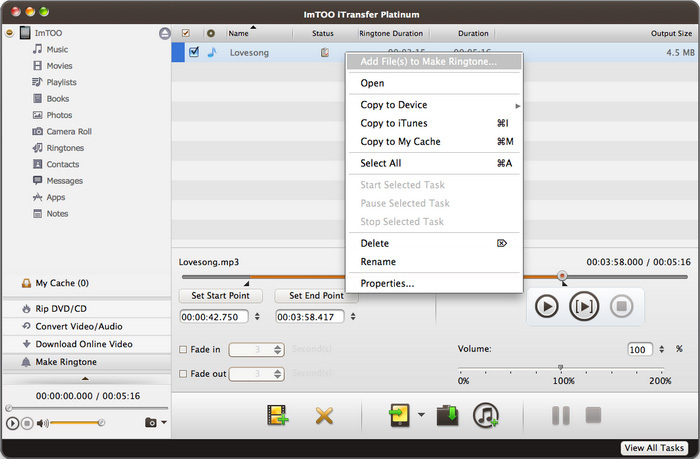 Automatically optimize the profiles in transferring or converting audio/video files into iPad/iPhone/iPod. Browse files with clear catalogs such as Artists, Album, Genres and etc; find what you want in a short time with the quick Filter function. Embedded web browser helps you to easy logon the most popular online video websites, like YouTube, Metacafe, Dailymotion, Break, Vimeo, Revver, Blip, Vidilife and Stickam. Proxy server configuration allows you to configure the network to your preference. 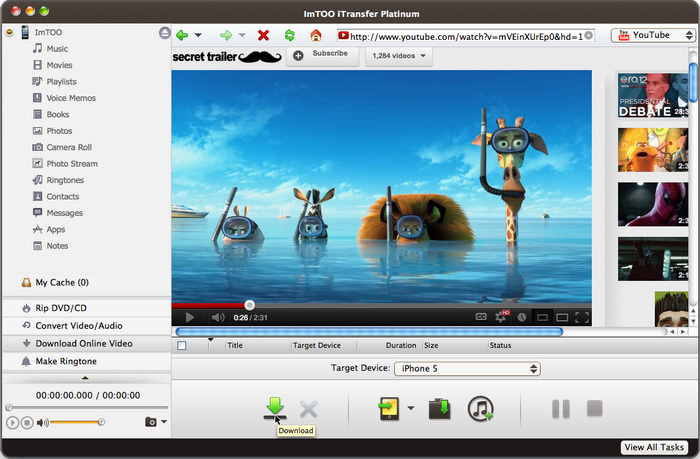 Built-in media player to easily preview DVD movies, photos and videos. Provide multi-lingual interfaces in language of English, French, Italian, Spanish, German, Japanese, Simplified or Traditional Chinese. Transfer multimedia files like movies, music, photos, eBooks between iPad/iPhone/iPod and iTunes/Mac, transfer among iPad, iPhone, iPod. Convert home DVD and CD to the devices and transfer to them without iTunes. Transfer apps between Mac and devices, manage documents for some apps. Convert and transfer almost all video and audio files to iPad/iPhone/iPod directly. Make iPhone ringtones by extracting segments from any audio/video file. Download videos from top online video sites like YouTube, etc, convert and transfer to iPad/iPhone/iPod. Support all iPad/iPhone/iPod models, latest iPhone XS, iPhone XS Max, iPhone XR, iOS 12 and iTunes 12.